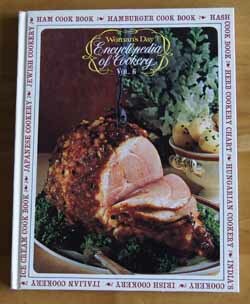 Cookbook #125: Woman’s Day Encyclopedia of Cookery, Vol. 6, Had-Kid. Woman’s Day, Fawcett Publications, NY, 1966. Cookbook number 125, halfway through my 250 Cookbooks! Coincidentally, I picked up this volume of Woman’s Day Encyclopedia of Cookery to do this week, and it’s Volume 6 of the 12 volume set – halfway through. Perfect for this week. I tuck happily into this cookbook, remembering the unexpected treats I found in the first 5 Encyclopedias of Cookery. This one begins with haddock, hake, and halibut. Next is a “ham cook book”, then a “hamburger cook book”. My mother liked the chili meatballs in the hamburger cook book. Herbs – a great section that includes a several-page chart with drawings, descriptions, and culinary uses of over forty herbs, and a section on how to build your own herb garden. Hermit: a dark spice cookie filled with fruits and nuts. Hominy, honey, horehound (an herb used to make horehound candy), hors-d’oeuvre, hot cakes. 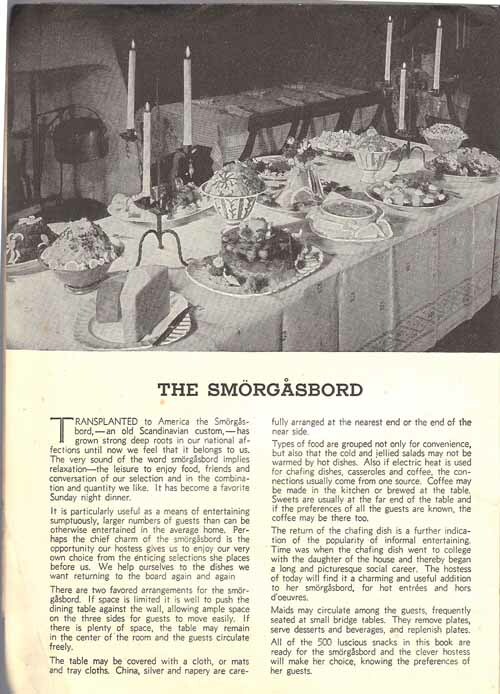 Hungarian Cookery: a great section with goulashes and stews and strudels. Ice: a good read on the history of the household use of ice. Ice cream cookbook. India’s Cookery. Irish Cookery. Italian. Jam. Jamaican soups. Jambalaya. Japanese Cookery. Jellies. Jewish Cookery. “Lokshen Kugl” in the Jewish Cookery section: This is my real find in this volume of Encyclopedia of Cookery. 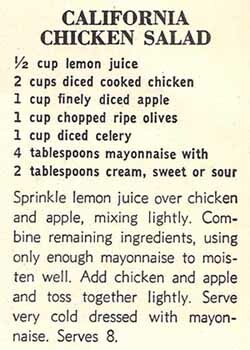 I’ve been looking for this recipe since college. From my previous post mentioning kugel: “Way back in college, a friend brought a traditional Jewish kugel to a party. It had noodles and was sweet: I had never had anything like it before and loved it. To this day, I have never made a sweet kugel for myself, but just the mention of ‘kugel’ gets pings of longing zooming around my brain.” In that crazy brain of mine, I thought the dish was named “luchen-kugel”. I googled but did not find any recipe similar to the kugel my friend brought to that long-ago party. Now I see “Lokshen Kugl” in this cookbook and know it is exactly what I was looking for. Back to the rest of the encyclopedia entries. Julienne, juniper berry, kabob (kebab), kale (pre-famous), ketchup, kid (as in the meat of a young goat slaughtered before being weaned). I bought two pounds of beef chuck and cut it into 1 1/2-inch cubes, trimming off the fat as I did so. And then, over a pound of onions! I would never use that many if I were doing this recipe-less. I weighed the sliced onions to get the proper amount and the pile of onions was about the same size as the pile of meat! 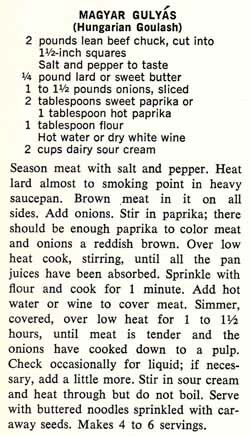 The meat is browned in lard – and yes, I have some. I simmered the meat and onions and paprika for at least a couple hours. Below is my version of “Hungarian Goulash”. I’ll let you know if I like it as much as my quick version. Sprinkle the meat with salt and pepper to taste. 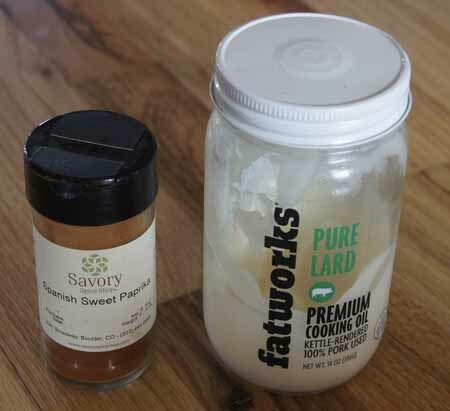 Heat the lard in a heavy pan of appropriate size, then add the meat and brown on all sides. Add the onions and cook just until the onions begin to wilt. Stir in the paprika – the meat and onions should be a reddish brown (so add more paprika if necessary). Cook and stir until most of the pan juices are absorbed or evaporated. Stir in the flour and cook a minute or two. Then, add water/wine to cover the meat (I used water). Stir in the sour cream and heat through but do not boil. Serve with noodles sprinkled with caraway seeds. 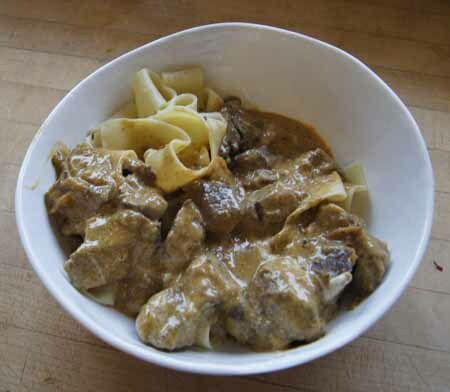 The sauce in this goulash is wonderful! The onions really were “melted” into it. I found the meat a little chewy, so next time I’d choose a better cut of meat (I used beef chuck and it was pretty fatty) or I would cut the meat into smaller chunks (I did 1 1/2-inch pieces). (I included these changes in my version of the recipe, above.) The caraway seeds mixed into the noodles were a great touch. Do I like it better than my quick version? Not really, but I like it equally as much. The sauce and the meat have better flavor, but the beef was a bit tough and the goulash took a long time on the stove. This would work well in a crock pot or a pressure cooker, or, save it for a long and chilly winter day when you want the aromas of a great stew wafting from your kitchen for hours. Note: This is the sixth in a series of 12 food encyclopedia volumes. I discussed the first five volumes here: Volume 1, Volume 2, Volume 3, Volume 4. aand Volume 5. Cookbook #124: Hershey’s Cocoa Cookbook, Hershey Chocolate Company, Western Publishing Company, Inc., USA, 1979. CAN I REALLY HAVE SOMETHING THIS GOOD FOR BREAKFAST? Boy, that was my first thought as I took a bite of Chocolate Banana Bread early this Friday morning. This recipe that I tried from Hershey’s Cocoa Cookbook is a definite keeper! Each and every recipe in this small cookbook features cocoa – the unsweetened powdered chocolate form of chocolate. 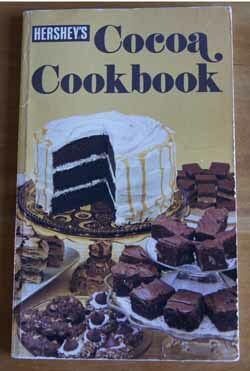 I think I always passed over this book thinking it’s “just another chocolate cookbook”. But no, the recipes are all from scratch, and I always have cocoa in my pantry because it keeps so well. And this cookbook has all the basics: cakes (including red velvet cake), cupcakes, cookies (brownies), candies (fudge), pies (cocoa chiffon pie), frostings, sauces (classic cocoa sauce and hot fudge sauce), and beverages (cocoa from scratch). 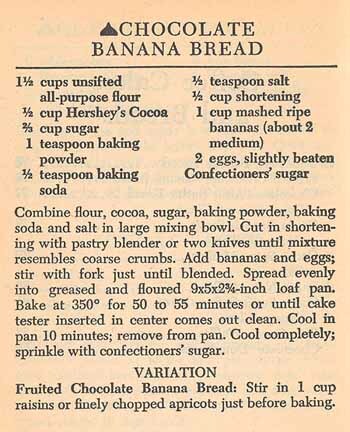 Plus many interesting recipes I’ve never seen before, like the Chocolate Banana Bread. The back cover of Hershey’s Cocoa Cookbook states that this cookbook was “free!”. It probably came with a new box of cocoa. Today, I found it for sale online for about five dollars. I chose this banana-based quick bread because as so often happens in the summer, I had very ripe bananas that needed to be used. I added the suggested raisins too. Here is the original recipe. I decided to use unsalted butter rather than the shortening. And I added raisins. I felt that the batter would fit better into an 8×4-inch loaf pan (and I was correct). Instead of cutting in the butter with a pastry blender, I used a food processor. I used an immersion blender to mash the bananas because I like to get them really smooth. Below is my version of the recipe. Lightly grease an 8×4-inch loaf pan and heat the oven to 350˚. Put the flour, cocoa, sugar, baking powder, baking soda, and salt in a food processor and pulse a couple times to combine. Cut the butter into half-inch chunks and add to the top of the dry ingredients. Mix with 6-10 short pulses, until the mixture is in coarse crumbs. Do not overmix. Mash the bananas by hand or use an immersion blender – whatever is your favorite method. Make sure the bananas measure to about 1 cup when mashed. Add the eggs and mix in well. 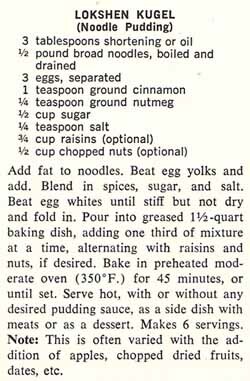 Combine the wet and dry ingredients in a bowl and add the raisins. Mix only until blended. Pour into prepared pan and bake at 350˚ for 55-60 minutes, or until it tests done with a toothpick. 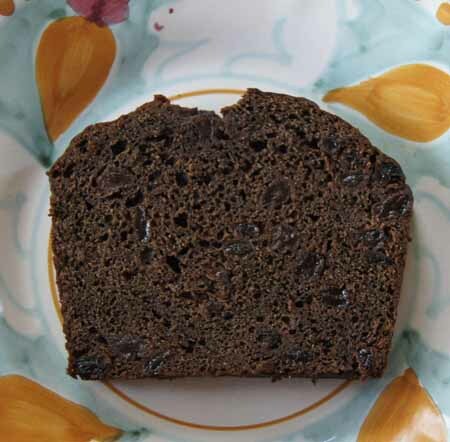 This dense, moist chocolate bread is delicious. It’s not overly sweet. The chocolate almost (but not quite) masks the bananas. I really liked the raisins. I really like this bread. Breakfast though? Yeah, sometimes. It was also really good with vanilla ice cream and a little chocolate syrup for dessert. Yum any way or time you eat it! 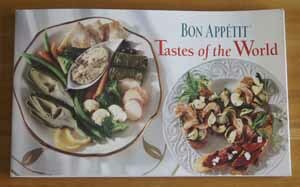 Cookbook #123: Bon Appétit Tastes of the World, Bon Appetit, The Condé Nast Publications, Inc., NY, NY, 1996. Now you can buy essays online fast! This little cookbook has lots of interesting ideas for spicing up my cooking. I am pretty surprised at this! It’s just one of those “free gifts” that one gets when they subscribe to a magazine. I covered another such Bon Appetit cookbook in a previous post and wasn’t impressed. But this one – almost every page has a recipe I could try. I can’t find hot Hungarian paprika so I substitute a little hot chile powder. 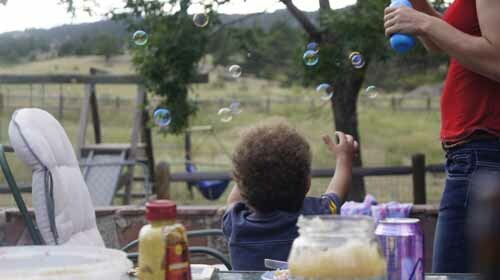 (But next time I am at Savory Spice Shop in Boulder I will look for it because I am curious.) I decide to grill these because it’s summer and we have company and it’s nice being outside with lots for my toddler grandson to do (like chase bubbles!). Below is my version of the recipe. Set up a food processor. With the motor running, drop the garlic through the feed tube until it is minced. Then, add the bacon, water, paprika, chile powder, salt, pepper, and allspice and process until a thick paste forms. 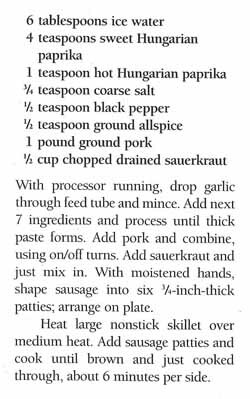 Turn off the processor, add the pork, then pulse a few quick times until all is combined. Remove the pork-spice mixture from the processor and stir n the sauerkraut. Form into six patties. 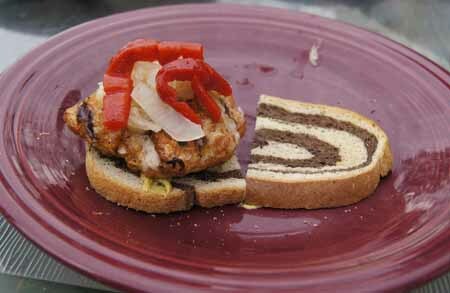 Serve on toasted rye bread with the garnishes of your choice. These were enjoyed by all! 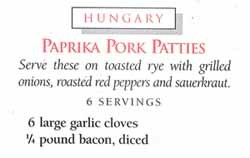 I will probably make them again, although I tried a pork sliders recipe a few weeks ago that my husband and I liked a little better. 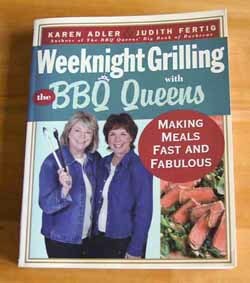 Cookbook #122: Weeknight Grilling with the BBQ Queens, Karen Adler and Judith Fertig, The Harvard Common Press, Boston, Massachusetts, 2006. I love this cookbook. Weeknight Grilling with the BBQ Queens pulls me out of my cooking doldrums – I can’t count the times I have flipped through its pages for ideas. Such fresh tastes! 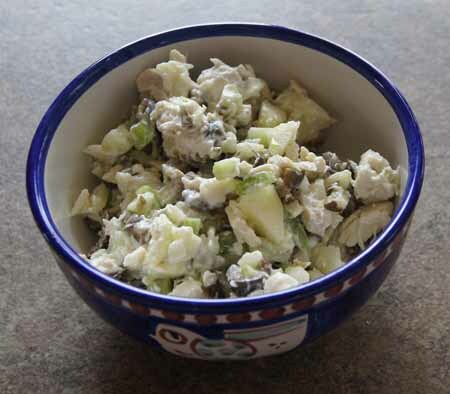 “Grilled Pork Tenderloin Salad with Steamed Baby New Potatoes and Anchovy Caper Vinaigrette” is one of our favorites. Fresh herbs and interesting spice combinations abound in most of the grilling recipes. Polenta, orzo, couscous, hearts of palm, jicama, fennel, capers, endives, hummus, curry . . . vegetarian, pork, beef, chicken . . . sandwiches, meats, salads . 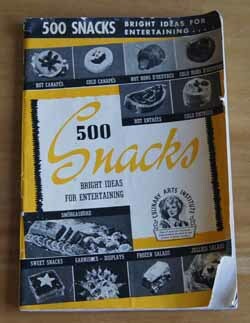 . . variety galore in this cookbook. I especially like the summer salad recipes. The only type of recipe I haven’t tried are the grill stir-fries. Weeknight Grilling with the BBQ Queens is also practical. I can easily find how to grill a pork tenderloin, for instance. It’s easy to mix and match ideas from different recipes. Instructions are always clear. So this book’s a keeper! Note that this cookbook was published in 2006. The authors, Karen Adler and Judith Fertig, are “The Barbecue Queens” (with the tiaras to prove it) and currently active in the commercial cooking community. Besides authoring numerous books, they have appeared on the Food Network, Better Homes and Gardens TV, PBS, and more. I plan to the BBQ Queens website for more grilling ideas. 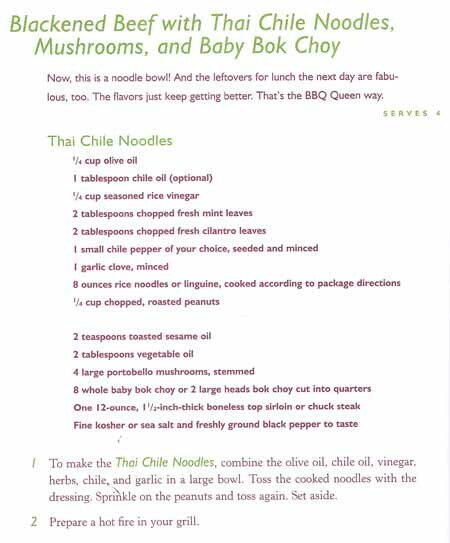 I decide to make “Blackened Beef with Thai Chile Noodles, Mushrooms, and Baby Bok Choy” for this blog. Below is a scan of the recipe in spite of copyright issues (I think it’s okay) to show you the layout and style of this cookbook. I’m going to vary this just a bit. For one, I think we want a little more meat. For three adults, I will use close to a pound of beef. The sirloin I have in the freezer is only about three quarters of an inch thick, but I’ll use it anyway. I want more garlic, but less hot chile. I miss-read the recipe and added a couple drops of sesame oil to the noodles, and I liked it that way. 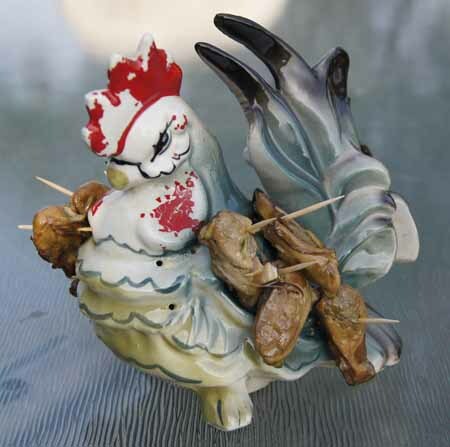 When I served this, it begged for soy sauce, so we passed it at the table. So. Below is my version (with a shortened title!). For the noodles, combine the oils, vinegar, herbs, garlic and chile for in a large bowl. Add the cooked noodles and toss. Sprinkle the peanuts on top. You can do this before you start grilling, if you wish. 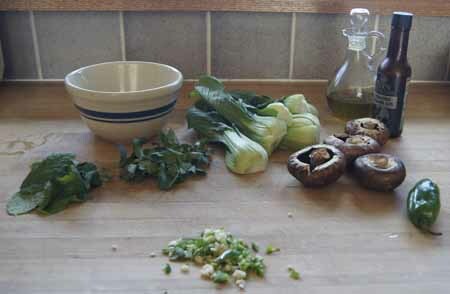 Combine the vegetable oil with the sesame oil, brush some of this mixture on the mushrooms and bok choy, then on the meat. Salt and pepper everything. 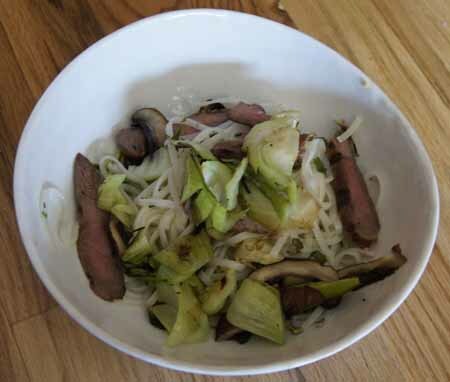 To serve, slice the steak and mushrooms into thin slices and the bok choy into bite size pieces and put on top of the noodles. Serve! We liked a little soy sauce on top. This was a definite hit and I will make it again!